Fast-paced, creatively-charged, and full of energy – that’s how I would describe typical creative agency jobs. The world’s top agencies thrive on innovation and creativity. Land a role in one and you’ll rapidly accelerate your learning, pick up new skills, and work with some of the world’s biggest brands. But how do you go about finding a job at a creative agency? What is the agency life like? What do top agencies look for in their creative hires? I’ll answer these questions and more in this in-depth guide to landing your first creative agency job. In an earlier post, we talked about the process for getting a job in the design field. While all that advice holds true, the hiring process for creative agencies is a bit more unstructured. Degrees and experience obviously help, but there is no fixed, regimented path to getting into a creative agency. Part of this stems from the nature of the creative agency business. While there are large firms like Leo Burnett and Ogilvy that work as industrial-grade creative operators, the agency landscape is dominated by small outfits. Agencies that focus entirely on creativity, i.e. boutique agencies, tend to be particularly small. 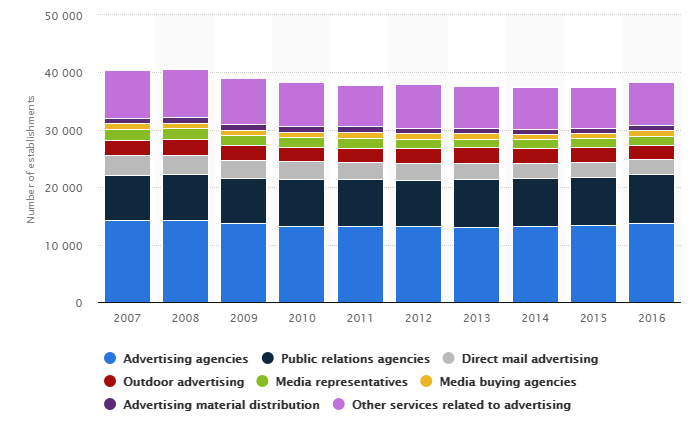 The total number of agencies in the US. At smaller agencies, hiring processes are seldom well-developed. They don’t have “feeder schools” or specific degree requirements. Many are even open to letting you work from anywhere. The only thing most care about is your creativity. This makes the entire creative hiring process highly fluid. Every agency will be different and you’ll have to fine-tune your approach accordingly. One might ask for your academic credentials. Another might just want a portfolio. And another might even hire you because you impressed the founder in a Twitter chat. The best advice I can give you is to do your homework and approach the process with an open mind. Give agencies what they want and they’ll give you what you need – a job. Landing a job at such agencies means doing your homework and following the instructions. What exactly do agencies do? And if you work in one, what kind of life will you have? You might skip these questions in the rush to send off applications, but I feel it is important to know what you’re getting into. It will help you prepare better for not just the interviews, but also the job ahead. Creative agencies are involved in, well, the business of creativity. It’s their job to come up with slogans, ad campaign ideas, creative copy, brand identities, and even strategic decisions to help their clients grow. Traditionally, when you talked about “creative agencies”, you meant ad agencies. Think of Don Draper and Mad Men – smart people coming up with creative ideas to sell a brand. For these agencies, the creative was the lure that attracted clients. Most gave it away for free but made their actual money from placing the ads in newspapers, TV, radio, i.e. media placement. There is now a new breed of creative agencies that don’t focus on media at all. Instead, they focus entirely on solving creative problems. These smaller “boutique” agencies often specialize in specific creative issues – branding, commercials, UI/UX, etc. Since these agencies make their money almost entirely from creativity, they give designers top priority. They’ll usually value creative freedom and innovative thinking as these are precisely why clients come to them. So when you talk about agency life, you have to factor in the kind of agency you’re working with. 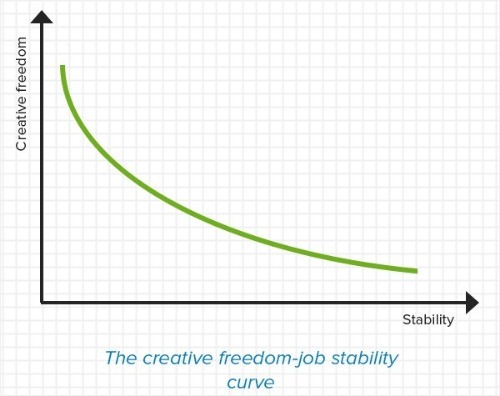 Big agencies with big clients give you stability and fatter paychecks, but your freedom is limited. Boutique agencies are nimbler and serve smaller clients, but they give you more creative freedom and responsibilities. Larger firms offer better compensation. On the downside, they’re usually located in cities with higher cost of living (think London, New York, SF, etc.). Creatives have much higher importance in purely creative agencies. In marketing, ad or digital agencies, creative usually takes a backseat. How much creative freedom you have is inversely proportional to the size of the agency’s target clients. At boutique agencies, you often get to redesign entire brands. At large firms, even minor changes have to be approved by clients. Larger firms tend to have more performance pressure. You can be expected to be on call and work odd hours. You are handling billion-dollar brands after all. There are more learning opportunities in larger firms, both from your immediate peers and the extended network the firm gives you access to. Smaller agencies usually have more freedom in terms of letting you work from home or take time off. Keep this in mind when you start your job hunt. Pick an agency that aligns with your values and career goals. One of the worst ways to get a creative agency job is to head over to mainstream platforms like Monster and Indeed. Sure, large agencies might post their wanted ads on them, but smaller agencies tend to shy away. Workamajobs: Workamajobs is operated by Workamajig, a project management system used by some of the world’s top agencies. Because of its close alliance with Workamajig, Workamajobs often gets creative jobs that might otherwise be behind closed doors. 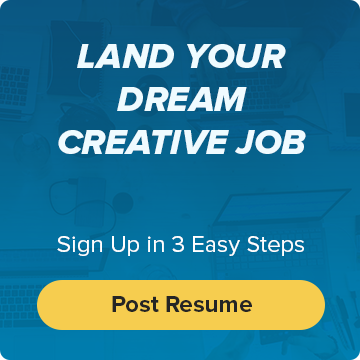 Create a profile, upload your resume, and start applying for highly coveted creative agency jobs. Behance Jobs: You might know Behance as one of the top places to host your portfolio. But beyond the portfolios and the community, it also has a thriving jobs section. You can sort the jobs by location, creative field, job type (full-time or part-time), and even search for specific companies. 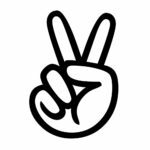 AngelList: AngelList started out as a platform to connect startups to investors. But over the years, it has morphed into a thriving job site for smaller companies. Most creative jobs on AngelList are either from tech startups or small boutique agencies. If that’s the kind of gig you want, make sure to check this site out. The Drum Jobs: The Drum is one of the most popular agency-focused blogs. So it shouldn’t be surprising that it also has a growing jobs section. There are gigs covering a range of agency types and specializations. From copywriting to design, you’ll find at least a few openings for a creative agency role. 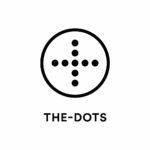 The Dots: This popular job site is frequented by some of the world’s most innovative creative agencies. Lots of filtering options also make it easy to use. The only downside is that most roles tend to be localized in the big creative centers – London, NY, etc. 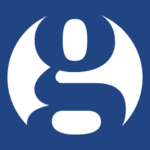 The Guardian Jobs: The Guardian’s jobs section has been an old haunt for London-based agencies. Given London’s stature as a central creative hub (bested perhaps only by NYC), you’ll find some of the most challenging creative agency jobs on this platform. The selection outside London, however, is poor. Smashing Magazine Jobs: The ever-popular Smashing Magazine blog also has a growing jobs section. Given its design focus, most gigs here tend to focus around product, UI/UX, and graphics design. If that’s your area of specialization, you can find some gems here. 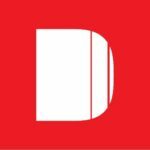 Dice: Have some tech chops and need a job in a creative agency? Then Dice is your friend. Although it doesn’t cater exclusively to the creative industry, Dice has some hard-to-find tech roles in agencies. Great for programmers, data analysts, and product managers. This is just the tip of the creative job hunting iceberg. There are dozens of other platforms – WeWorkRemotely (for remote jobs), Anthology (jobs for the already employed), CreativePool (UK-based jobs), Built In NYC (NYC-based jobs), MediaBistro (media jobs), Idealist (non-profit jobs), etc. Whatever you do, don’t limit yourself to general-purpose mainstream platforms. Apart from this, also remember that a lot of agencies don’t advertise their jobs. Rather, they hire from internally referred candidates or their own database of CVs. So if there is an agency whose work you admire, don’t hesitate to send in your resume and portfolio, even if they’re not advertising any open spots. When a position does become available, the agency will go through all the old resumes it has received in the past. Staffing firms are among the best-kept secrets of the creative industry. You see, creative agencies tend to have a very high turnover rate. Almost 30% of agency employees leave for other opportunities every year. Given such attrition rates, agencies are often in perpetual hiring mode. And feeding them quality candidates – particularly for part-time or temp roles – is the job of staffing firms. A staffing firm connects agencies with good creatives. Creatives register with the firm and indicate their availability as well as job preferences. When an agency has a suitable opportunity, the staffing firm reaches out to the creative to send in an application. Think of them as job brokers that do all the heavy lifting for you. And since most staffing firms make their money from agencies, they’re entirely free for you. ArtisanTalent: Creative roles in a range of industries. iCreativesStaffing: Design-focused temporary and part-time roles. You’ll have to through a vetting process. CreativeCircle: One of the largest creative staffing firms around. Most opportunities tend to be freelance/part-time. TheBossGroup: Focused on temporary opportunities, especially in non-traditional industries and locations. VitaminTalent: Agency-focused opportunities with a strong focus on design and marketing roles. 80Twenty: Focuses on creative and marketing roles based out of NYC, LA and the Bay Area. Understanding creative roles and using the right platforms is important, but they can’t trump a well-crafted creative agency job application. Show diversity in your work. At an agency, you’ll have to work across mediums and industries. Don’t limit yourself to one field or design-type. Show growth over the years. Instead of only including your latest work, share some pieces you did five years ago. This will show recruiters that you can learn and apply new skills. Go behind the scenes by including rough sketches, wireframes, and anything else that shows your design thinking. Reorganize your portfolio to include your best work at the very beginning and the end. People remember the start and the end of a sequence (aka the “Serial Position Effect”) the most. If you’re targeting a specific agency, include a few samples that focus on their top clients. Say, if the agency’s biggest client is a car brand, prioritize pieces you’ve done on cars. One of the worst things you can do about your application is to send in a cookie-cutter cover letter. Agencies can make out when you’ve actually taken time to know them vs when you’re shooting off the same template to everyone. Include some details that show you’ve taken the time to learn about the agency. Perhaps mention their big clients, the work done by their founders, or their recent awards. Tell them why you’re a good fit. Again, focus on what the agency does and how your experience will help them do it. If the agency focuses on branding, for instance, you can talk about your experience creating brand identities as a freelance designer. Focus on problem solving. Remember: agencies hire you to solve issues, not just make pretty things. Tie your experience and skills to the agency’s biggest problems. Example: if the agency has a limited footprint in content marketing, you can talk about how you can help them expand in this space with your content experience. And lastly, always mind the two P’s – personalization and proofreading. No one likes a cover letter with a generic “Dear Sir” and a dozen spelling mistakes. This might sound like Job Hunting 101 but you’ll be surprised at the number of people who simply gloss over the instructions when applying. Agency work is all about details. If you can’t even be bothered to read the instructions, you’ve already set a bad impression. Apply only if you fit the requirements. 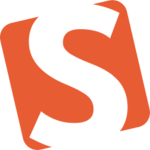 If the employer wants a UI/UX designer with Sketch experience and you’re a graphic designer who hasn’t even heard of Sketch, don’t apply. You’re wasting both your and the employer’s time. Follow the application instructions. If they’ve asked you to include a link to the portfolio, don’t attach a PDF. If they’ve asked you to fill a form, don’t send them emails. Employers will usually ignore even great applications if they don’t follow the instructions. What’s the first thing people see when they Google your name? Is it a Twitter profile that was last updated in 2013? Or a thriving blog where you’ve shared your thoughts on design, creativity, and agencies? At this point, you can be 100% sure that once your application passes the first round of screening, the employer will look you up online. This gives you a massive opportunity to make a favorable impression. Whatever you tweet, write, and share adds to your resume. Think of it as an expanded canvas that gives you a platform to share things you can’t include in your application. Make a list of the top ten results for each of these search terms. Are the results favorable? If you have a blog, does it show up? Can people see your content on platforms like Quora, Medium, etc.? Your goal is to craft an online presence where the top search results give employers an insight into your thinking, skills, and experience. Auditing where you currently stand is the first step in this process. Some people will tell you to start your own blog and share your thoughts on design-related topics. In principle, this is good advice. Except most creatives have neither the time nor the knowledge to promote their own blog properly. The technical requirements to keep your own blog hosted and updated can also be challenging. So instead of blogging on your own, leverage existing publications and platforms to share your content. Medium publications, Quora, guest posts on prominent industry blogs – all of these have a much better chance of showing up at the top of search results. Further, getting published on a top blog also implies that a) you’re a good writer, and b) you have something interesting to say. A potential employer will be much more impressed if you have a guest post on Smashing Magazine than if you have the same content on your own blog. 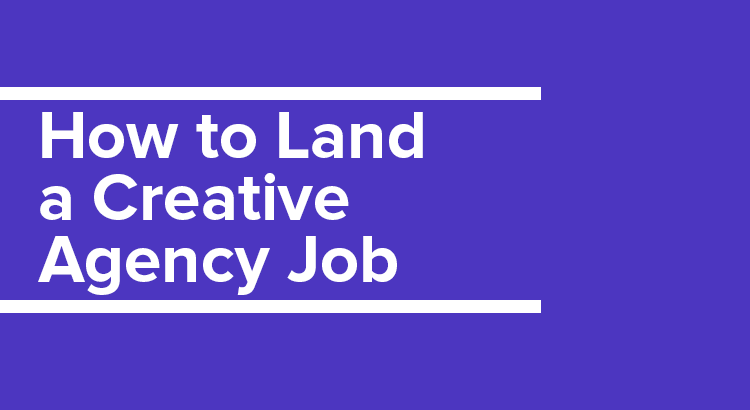 There is no fixed path to landing a creative agency job. If you’re targeting smaller agencies, you’ll find that they seldom have well-defined hiring processes. Rather, they look for a good cultural fit and a solid set of skills. If you can showcase these with your portfolio, resume, cover letter, and your online content, you’ll have an easy road to getting that agency gig you’ve always wanted. And of course, make sure to look on the right platforms. 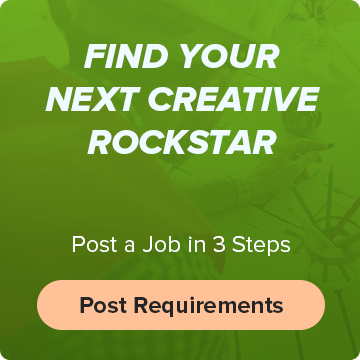 Start by creating a profile on Workamajobs, upload your resume, and start applying to the world’s top creative agencies.